Are you looking for a family getaway? 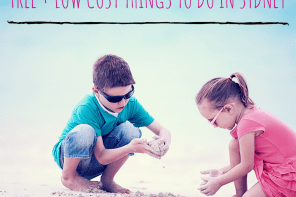 Or, do you need some ideas for next school holidays? Look no further! 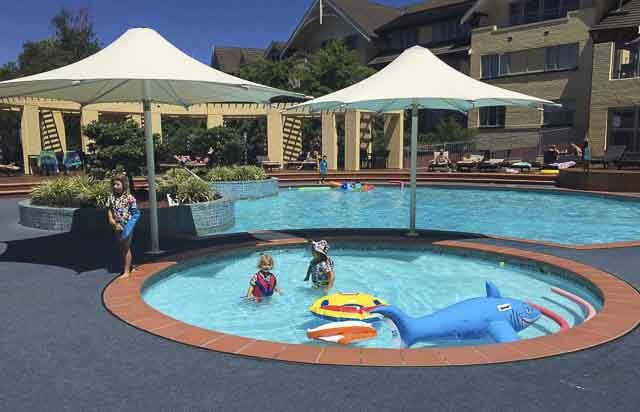 The Fairmont Resort Blue Mountains MGallery by Sofitel is a paradise for families. 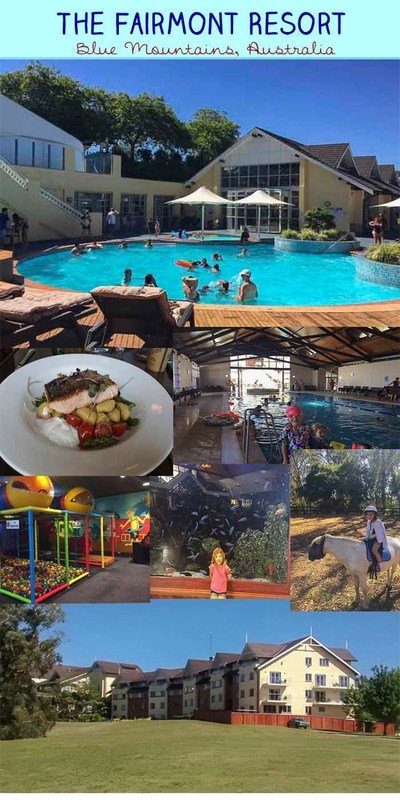 Unlike most Blue Mountains family accommodation, the Fairmont is a true family resort with a plethora is excellent activities for children of all ages… and for the adults too. There’s even a proper kids club in school holidays. yes, Mum and Dad you CAN go to the Spa. PS Grab a cup of tea, this is the longest of all the Fairmont Resort reviews! Where is The Fairmont Resort? Check out the free breakfast offer on the advert below. 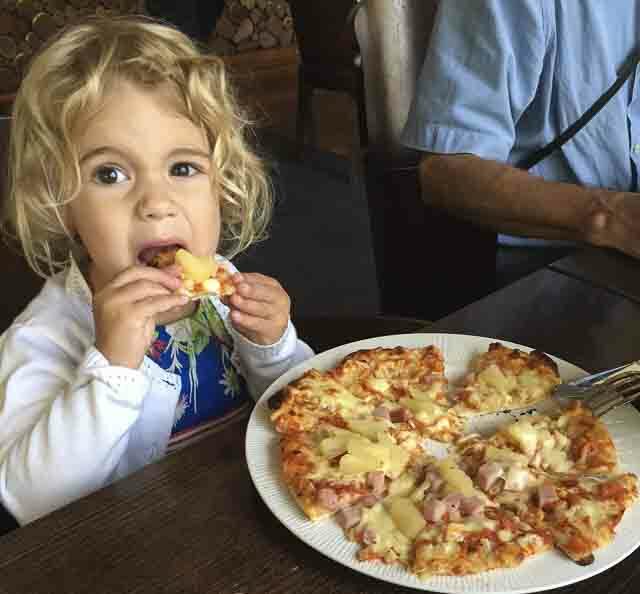 Leura is right alongside Katoomba, so the Fairmont is super central to all the excellent things to do with kids in the Blue Mountains. 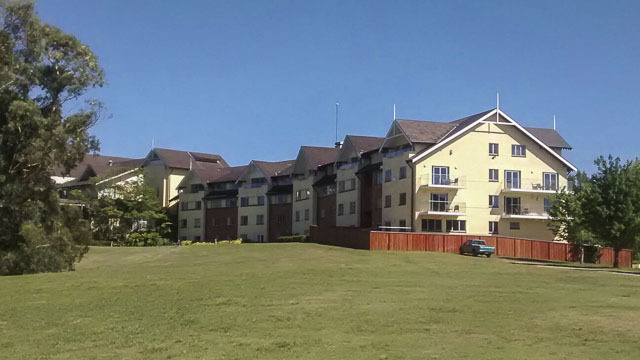 People often think it’s the Fairmont Resort Katoomba, but the resort is definitely in Leura, just a few minutes drive from Katoomba. Check out this Google map to see the exact location. 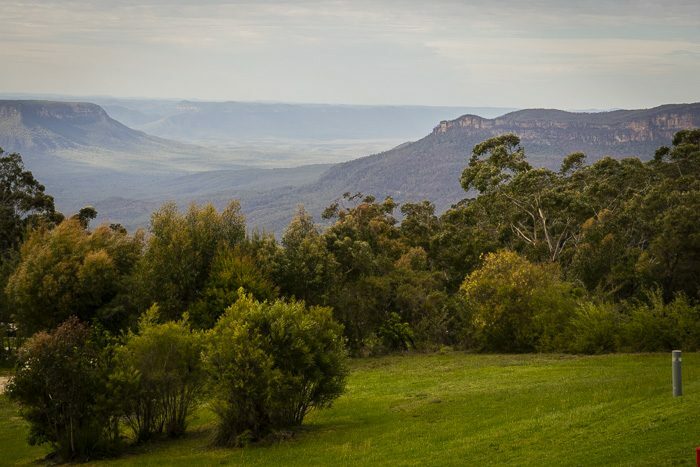 The location is unbeatable with gorgeous Jamison Valley views. From the resort, you can go for a hike, if you are a family that loves the outdoors. The Concierge team has maps and information about local tracks accessible from the resort. Spacious and comfortable family rooms. The last thing you want is not to have enough room to swing a cat. 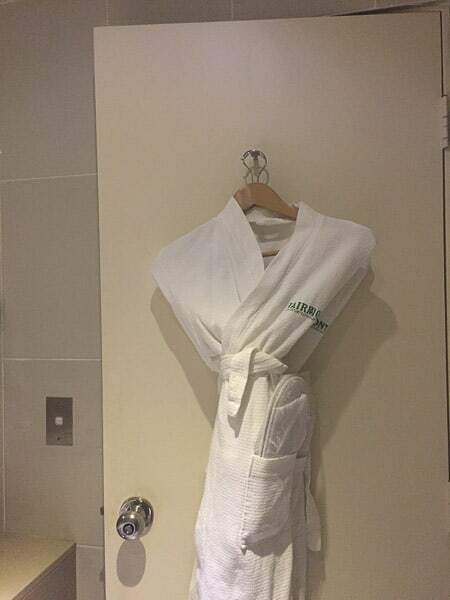 There were some details that I absolutely loved such as a Nespresso Coffee Machine with complimentary coffee capsules and bathrobes for the adults, besides towels. There is a kids club during school holidays with lots of activities to do every day, excluding public holidays. There’s a Kidszone with three games rooms. 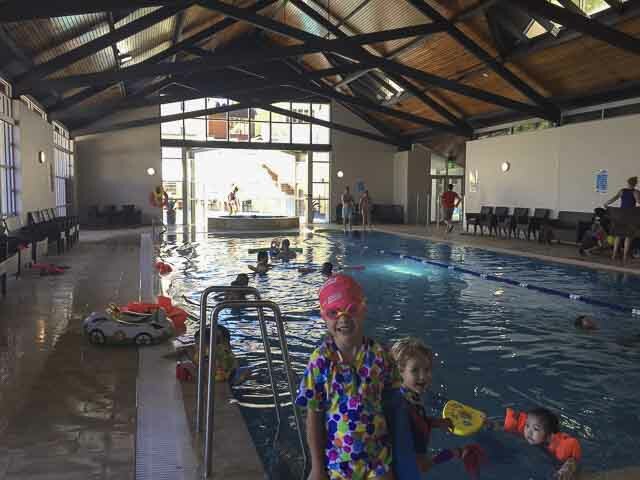 One big pool and a perfect little pool for toddlers and young children outside, overlooking the lakes. Towels for the swimming pools area are provided for free. A heated indoor pool and spa with impressive high ceilings for the colder months or cloudy days in summer. Golf course, tennis courts, gymnasium, daily yoga lessons and running club at the weekends for the active adults. Manicured gardens, library, board games, billiards room, cinema sessions and relaxing treatments at ‘Ubika Spa’ for those who need to unwind. Several options for breakfast, lunch and dinner inside the resort. The breakfast has one of those buffets that you just want to try everything. Free wine tasting sessions during school holidays and happy hour at The Tavern from 5pm to 6pm. But the most important feature was that the resort did not look or felt crowded despite being at full capacity during Summer School Holidays. (I hate going on a holiday and have to queue for everything). We went to the Fairmont Resort Blue Mountains with my parents who were over from Spain. All of us enjoyed the“mini holidays” at the Fairmont, my three daughters had a blast. Thanks to its amazing facilities and thanks to the kids’ club activities during school holidays, there is something to do for everyone. To summarise, the Fairmont Resort Blue Mountains offers balance with the perfect setting to relax and a great place to explore. I saw several families with grandparents, included, like us. Our family would go back here any time with my husband (who had to work this time) or with my parents, if they have the chance to come back to visit us again. The miniature train that the Fairmont is restoring. My children loved it. But my father even more! He stopped to watch it every time before going up to the rooms. The Fairmont Resort Blue Mountains facilities and activities are endless. You cannot get bored! 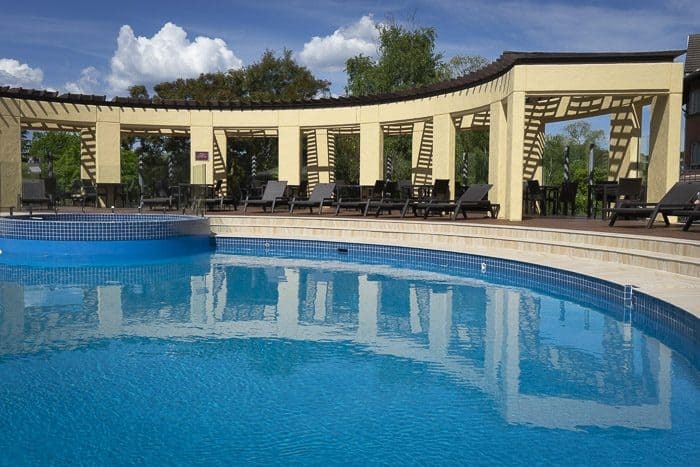 Swimming pools: outdoor pool for adults and little children; deck to sunbake; indoor pool, sauna and spa open all year. There are change rooms, showers and toilets. Gymnasium, daily yoga at Misty’s room and tennis courts: the minimum age requirement is 16 years for the gym. 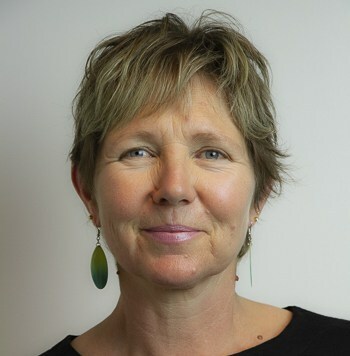 Yoga costs only $10 per person and no bookings are required. So, if you feel like sleeping in, enjoy your rest and don’t feel guilty. Furthermore, if you forget your tennis racket and balls, Reception can help you. Just ask. Leura Golf Course and Golf Simulator: this is the oldest golf course in the Blue Mountains. It has 18 holes with spectacular views of the Jamison Valley. The Leura Golf Course TruGolf Simulator has internationally renowned courses to play. 30 min session is $20 and 60 min is $35. Beautiful gardens: little children, parents with prams, older couples or couples looking for a romantic walk will love to go for a stroll in the gardens. 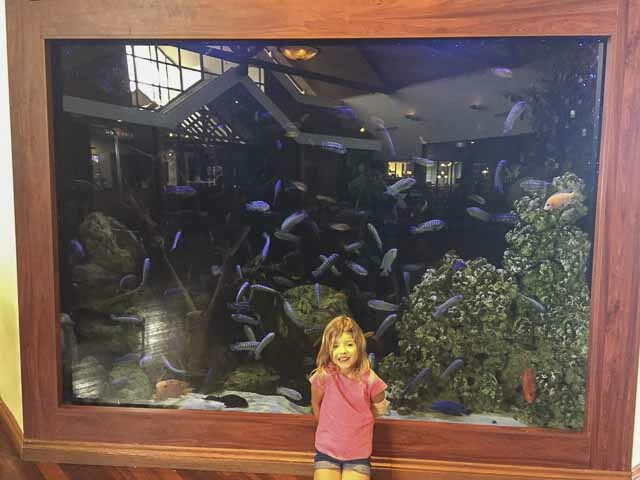 The little ones will enjoy observing the fish and ducks in the lakes. There is even a little waterfall. Also, there is a maze, where kids will have a good time exploring it or playing chasing each other, like my three daughters did. Elegant library, board games for all ages free of charge available from Reception, and billiards room: the library is a very inviting quiet area. It is certainly a place to relax (children need to be supervised.) The billiards room has pool, snooker and billiards. Note that billiards room is not available for use by children under the age of 16. Lara’s of Leura Boutique: it has a selection of gifts like Australian made scented candles and every day items. It has even cozzies in case you forgot yours or quality wool cardigans, if the temperature drops in autumn. Cinema: watch complimentary movies on the big screen in the auditorium. There were sessions in the morning, late afternoon and evening. There were movies for children and also some classics like Forest Gump or Grease. High ropes course: this is brand new in 2018, terrific for the older kids and teenagers… and we adults too. Ice skating rink! This is currently being built… we will report when it opens, looks like 2020 at this stage. Other services and activities that the resort offers are: babysitting, Segway tours, running club at the weekends, free cheese and wine tasting. 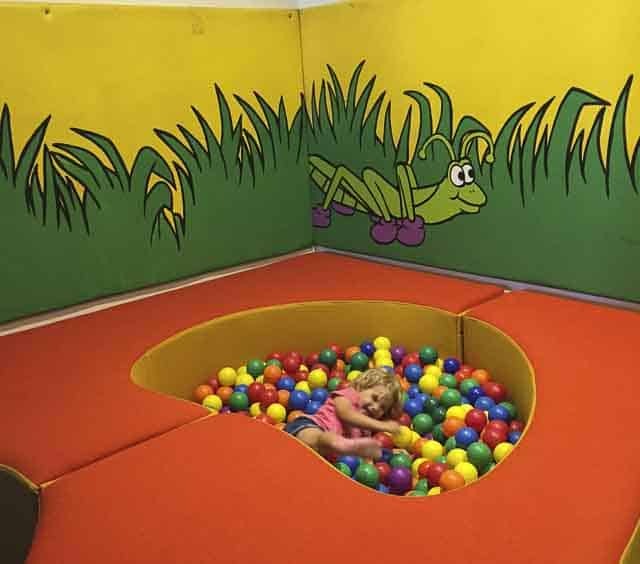 Kidszone: this area has a room for young children and another one for older ones. Also, there is a mirror maze, a mini bowling alley and a tennis table. 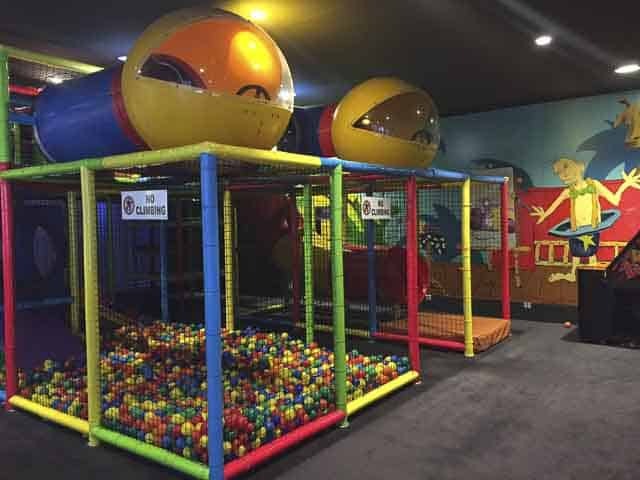 Young children can enjoy the ball pit, the jungle gym and more. 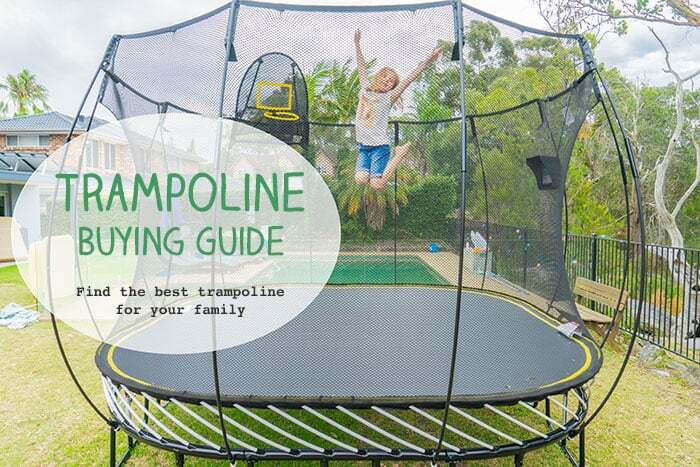 The older ones can explore a giant jungle gym that is designed for 5 to 13 years old. There are also games that are coin operated. KidzKlub: during school holidays, KidzKlub is a fully supervised activity from 2:30pm to 5:00pm daily, except Public Holidays. The cost was $25 per child from 4 years old to 12 years old. 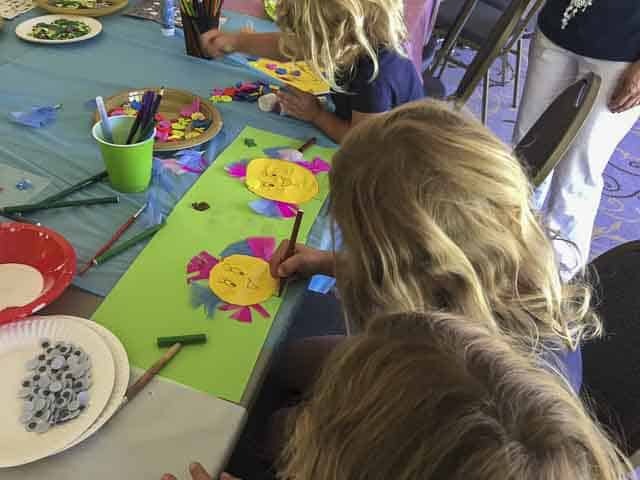 KidzKlub and its dedicated staff also offer free activities too such as Arts and Crafts and mini Master chef. All the children’s activities have to be booked in advance. My girls went to the Arts and Crafts session. The educator was lovely and there were plenty of materials and resources to use. 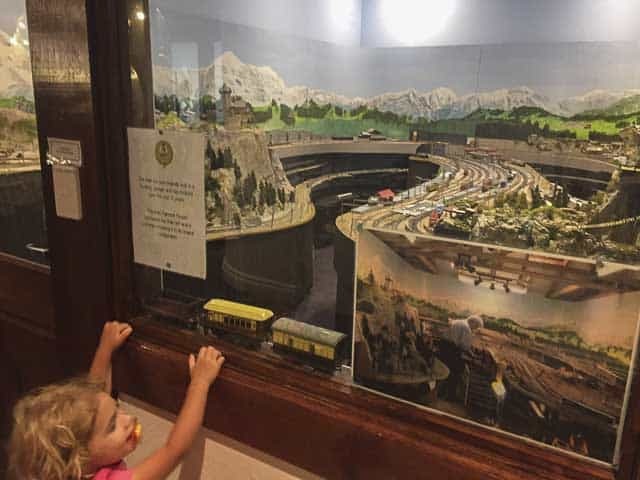 Other stuff at extra cost (between $5 and $10): rides include the Fairmont Express Train, the merry-go-round, ride-on-cars and pony rides. My children visited the ponies Buddy and Diego, located at the oval. 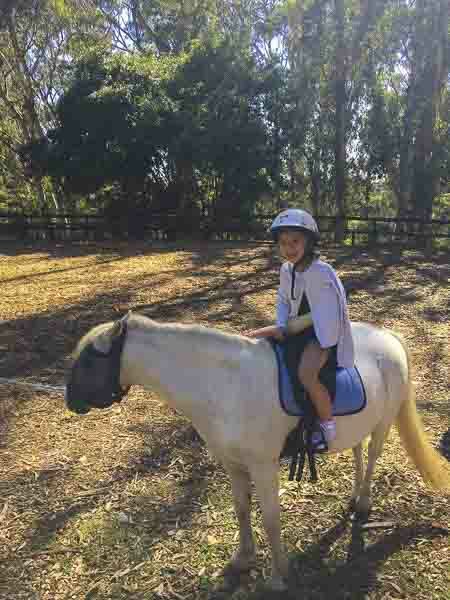 It was the first time that my daughters went for a pony ride and they loved it, except Miss 2 year old, who wanted to follow her sisters but then she was scared. The best family rooms at the fairmont include the standard and superior rooms with two queen beds. The courtyard rooms are lovely too, with enclosed courtyards, these can be configured with two singles or one king bed plus extra beds for the kids. Family suites have two interconnecting bedrooms, a king for the adults with ensuite then a second room with two singles for the kids. There are also pet friendly bedrooms too, plus very luxurious suites. When travelling with an assortment of kids, it’s often wise to call the resort direct and explain your circumstances then ask their advice. In room dining and happy hour at the Tavern are available every day. We had breakfast at the Breakfast Buffet Jamison’s Restaurant whilst enjoying the stunning views of Jamison Valley. The buffet had a big variety of food from sweet to savoury. Also, there were plenty of drinks, milk, all sort of coffee and teas, hot chocolate and even you could make your own nutritious juices combining several fruit and veggies. Jamison’s Restaurant also offers a classic dinner buffet and a seafood dinner buffet. We had lunch and dinner at Embers Restaurant. 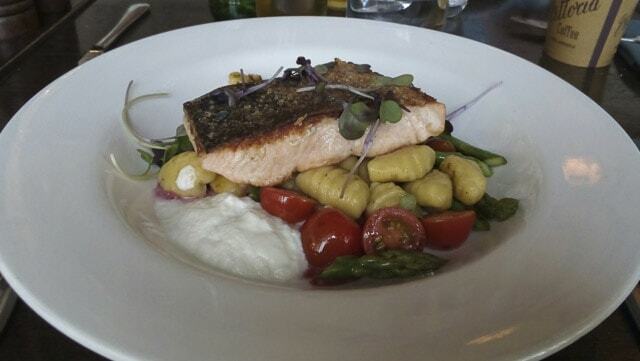 The food was delicious and well priced considering that it is a 4.5 star resort. Kids menu was abundant and it had healthy options, too. Embers Restaurant kids menu not only offers veggies but also fruit salad for dessert. My daughters chose ice cream and brownie, because “they were on holidays” (Miss 4 year old said this to me, the fussy eater of our family). 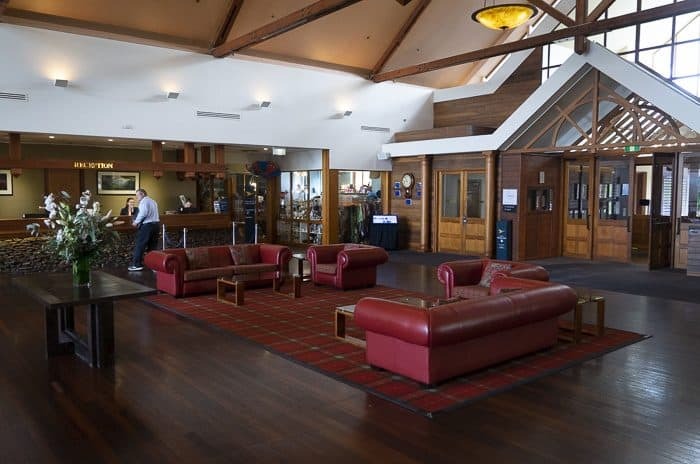 The Leura Golf Club Bistro is also another place to have lunch or dinner with a clubhouse atmosphere. The range of craft Sydney Brewery beers or regional wines could be a good excuse to go out. For an intimate dining, the Eucalypt Restaurant offers a modern Australian cuisine menu paired with an extensive wine list. And, the Sublime Lounge in the lobby is the perfect place for an after dinner drink by the fireplace in winter or a cup of coffee and cake in the afternoon (my father said that he ate one of the best chocolate cakes ever!). There are 16 rooms in the day spa, and the spa menu is very wide and varied; from massages and facials to longer wellness treatments and rituals for men, women, couples and for pregnancy. A little bit of luxury is always welcome…. We went to the Sublime Point Lookout and the Gordon Falls Lookout and Picnic Area. Those are very easy walks suitable for young children (remember always to keep a close eye on them, as some sections are not protected). Also, the walks were not challenging, so older adults like my parents could do them. Leura Cascades is another nice excursion, although we didn’t have time to do this one. We ate very well in Bon Ton Bistro and Waygoose Café, both located in the Leura Mall. My 6 year old tried the Dijon escargots and she said that were delicious. She keeps asking to go back to the Blue Mountains to eat escargots in the Bon Ton Bistro! I tried the gazpacho (Spanish traditional cold soup) of the Waygoose Café and I can reassure you that it was nearly as good as the one that I make. Finally, did you know that Leura and Katoomba have the best cafes for chocoholics? I saved this information for my next post. But, meanwhile, you might want to do a search of The Blue Mountains Chocolate Company, Josophan’s Chocolate Shop / Café Madeleine, and the super kid friendly Gingerbread House. Other attractions of the area are the Scenic World, the Everglades Mall, the Leuralla Toy and Railway Museum, the Echo Point Lookout, etc. Check these articles out! 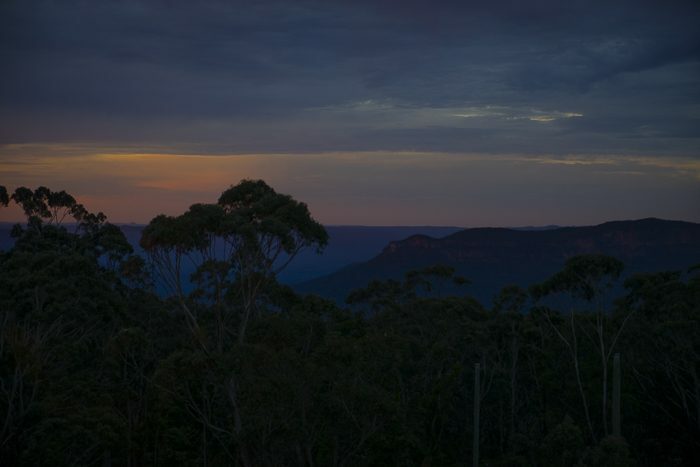 Read about all there is to do in the Blue Mountains on these posts. For the majority of families, a good beach cannot beat the mountains in summer. 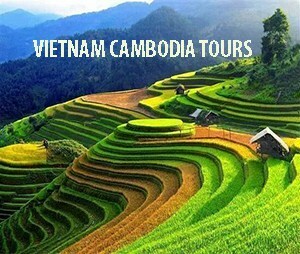 But, if you want a change of scenery, enjoy a much less crowded destination and have tons of fun, don’t think twice. Go to Leura and discover the Blue Mountains with all that has to offer!!! Keep in mind the Fairmont Resort Blue Mountains MGallery by Sofitel. Cozy in winter with its half-timbered lobby, confortable rooms and the Sublime Lounge café where you can sit next to the fireplace; and, just perfect in summer with its swimming pools and golf course. 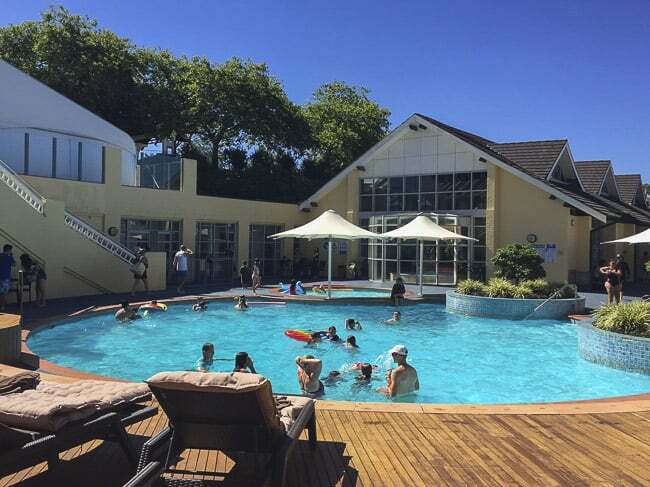 Being at a doorstep of the main attractions of the Blue Mountains, the Fairmont Resort Blue Mountains is a great choice, specially if you find a good deal or special for your stay. I cannot wait to go back to the Fairmont Resort Blue Mountains. Did I mention on the article that I did my first yoga class after six years? I couldn’t be happier, yoga with a view, the always-beautiful Blue Mountains. Leura village is only 100 km from Sydney. Taking the M4, it is around hour and a half by car or nearly two hours by train from Central Station. Leura can be reached by public transport, although car is the easier option when travelling with kids. Leura Rail Station is around the corner from the main street, full of unique shops and cafes. Blue Mountain Trolley Tours / Explorer Bus is an hourly hop on and hop of service that runs 7 days a week. The bus route consists of 29 stops / locations, including the Fairmont Resort Blue Mountains. Pin this image to Pinterest! So that’s it, the longest of all the Fairmont Resort Blue Mountains Reviews ever… hope you enjoyed this. We really do believe that the fairmont is the best Blue Mountains resort and we are always happy to recommend it to families. Have you stayed at the Fairmont yourself? If not, would it appeal to your family? I travelled as a guest of Accor Resorts. I really want to thank the team for the warm welcoming and all the last minute arrangements. They really looked after us during our stay of two days. My parents paid their room and I paid one night accommodation. One night was free. 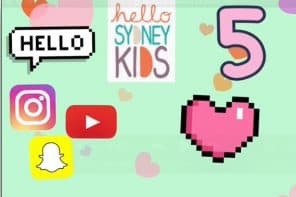 This post contains affiliate links, meaning that if you book a stay at the fairmont a small fee is paid to support Hello Sydney Kids, at no cost to you. 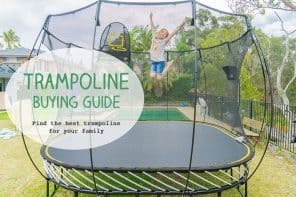 This place looks fantastic for parents and kids. Thanks for the informative review! Great review! I would never have previously thought that the Fairmont is a place to take kids but I’m sold! I/we have not stayed at the Fairmont family resort yet, but it is definitely appealing and I would love to take my mum & dad there when they come from overseas to visit their 6 year old grandson. I love the location and the resort facilities and program looks amazing! Hope to see you soon. Wow, sign us up! This all sounds amazing. Thanks as always for a thorough review HSK! Looks amazing for both parents and kids. Would love to spend time there with family. It is so fantastic to have a practical and informative review of where to holiday as a family and for all to enjoy! This type of review and this type of holiday is just what parents need. 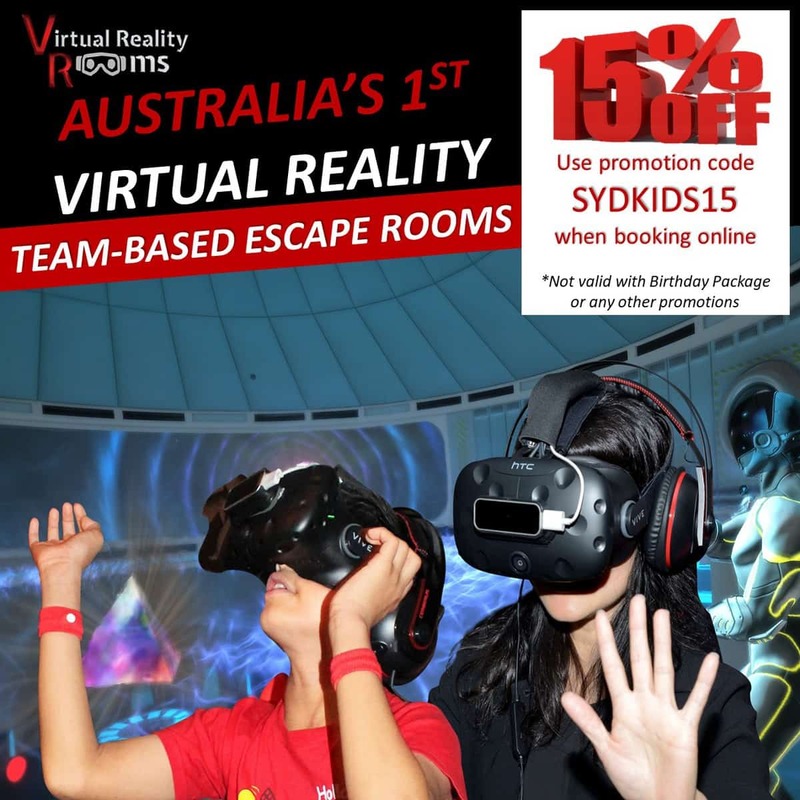 It is excellent that this fab resort is in such a magic location, offers SO much for the kids and parents to have an enjoyable and more so, pleasant experience together. I love that it can be as active or slow paced as you like and you can still go and explore the surrounding areas of the Blue Mountains. Thank you for providing such an amazing overview of what to expect and what you can experience on a family holiday to Fairmont Resort. We will certainly be looking at it for a family get away! Always find your reviews so informative. My family has been to The Fairmont once to celebrate my mum’s 60th, and it blew our mind. My son and niece loved everything about it. The adults loved it equally as much. We would love to be able to go there again. Would recommend this place to anyone. Amazing. A wonderful time away for all family members set amidst one of the most gorgeous places in Australia. Joy!! We would love to stay there one day. We love family hiking in the mountains and during school holidays my kids would love the kids club and us some adult time playing Golf or going to the spa. That would be bliss !! 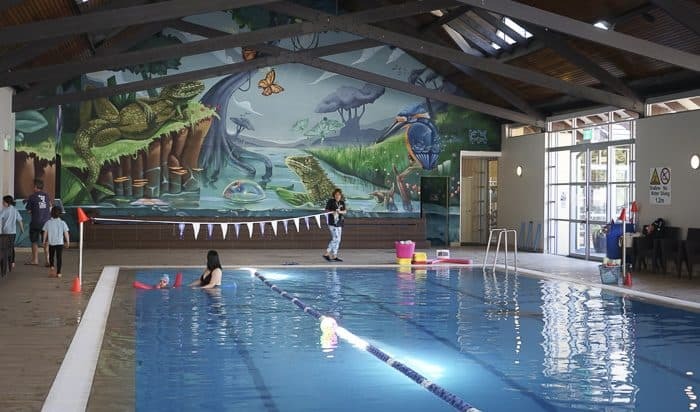 I’m a mother of 3 very active young one’s and just know my kids would enjoy all that Fairmont family resort had to offer them and it would most definitely be a bonus for myself to unwind in the spa while the little ones were at the KidzKlub.